June is the best of times and the worst of times. Best because of all the stone fruits that are in season (cherries, apricots, peaches, plums, pluots, nectarines, the list goes on). The worst because of all the stone fruits that are in season (I have a perpetual stomachache from eating too many). There is nothing quite like binge-eating cherries to remind you that when it comes to certain things, you really have no self control. So my response is to pack as many of these fruits into baked goods as possible, and then send them out into the world to find new bellies to torture. Unfortunately, as fast as I’m using them in baked goods, I’m replenishing my stock at the two farmers’ markets I frequent every week. I realize it’s a simple fix: I could just not buy so many fruits. Like I said, no self control. Luckily this pie uses a hefty stock of blueberries and apricots, so if you’re up to your ears in early summer fruit, this is the pie for you. 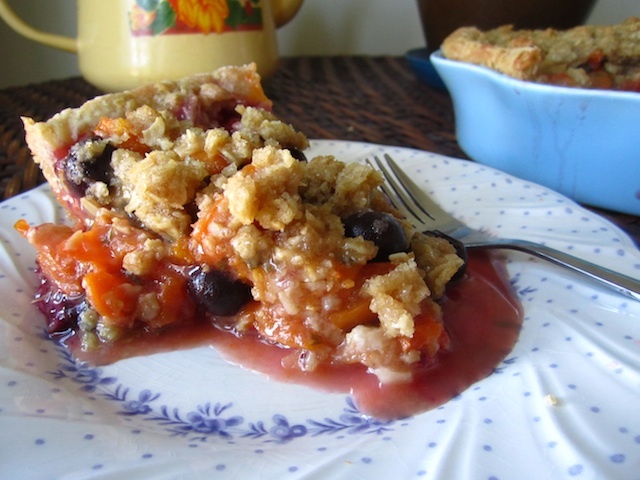 You could easily get creative and try this pie with different types of fruit. Strawberries, peaches, nectarines, and raspberries will all go nicely with the basil infusion. I can imagine any combination of those would produce a pie as delicious as the apricot-blueberry combo. The lemon has a very strong presence, so I’d recommend not using as much of the lemon zest if you’re not a fan of that flavor. The basil brought exactly what I hoped it would: a certain sophistication to the flavors of the fruits. It’s not overpowering at all. In fact, I think I’d like to start throwing basil or other herbs into baked goods a lot more often now. This pie is very juicy, so don’t be alarmed or disappointed if it crumbles a bit (as it is destined to do) or if the filling is a little runny. Next time I might use an extra tablespoon of corn starch to see if that would do the trick a little better. In any case, this is a perfect, easy, and delicious summer pie. Adjust oven rack to lowest position and preheat oven to 425°F. When oven is ready, line chilled pie shell with foil or parchment paper and fill with weights (or dried beans), and bake on the lowest rack for 15 minutes. Remove weights and liner, turn pie, and bake until the bottom crust just begins to get color on the top, about 5 minutes more. Remove pie shell from oven and allow to cool completely. In a bowl, combine the oats, flour, brown sugar, and 1 ounce granulated sugar, and whisk together until incorporated. Add the cold butter pieces and rub the dry ingredients into it using your fingers, until the dry ingredients and butter form a crumbly dough. Chill for 30 minutes. Adjust oven rack to lower middle position and preheat oven to 350°F. 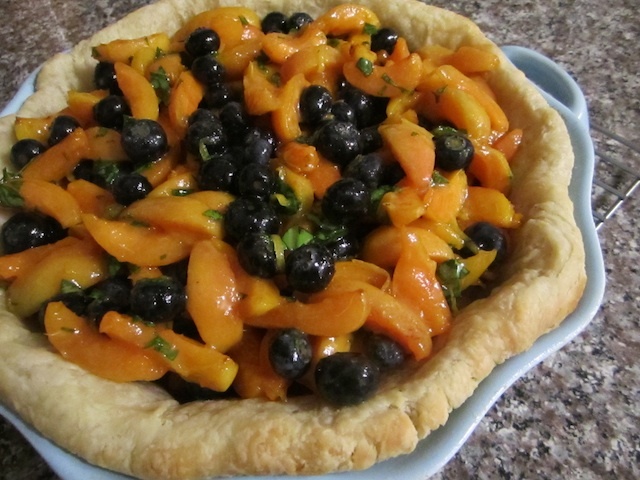 In a large bowl, gently toss the blueberries, apricots, basil, vanilla, and lemon zest together. In a small bowl, whisk together the sugar and cornstarch and add to the blueberries. Toss gently to combine. Pour the berry mixture into the par-baked pie shell. Crumble chilled oat topping over the filling, cover the pie loosely with foil, and bake for 35 minutes, until the blueberries begin to burst and bubble. Remove the foil and bake until the topping turns a crisp golden brown, and the blueberry juices bubble, approximately 15 additional minutes. Allow the pie to cool completely before serving. 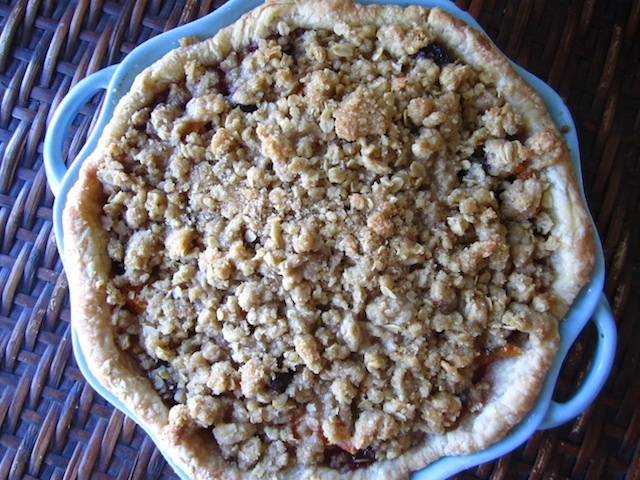 This entry was posted in Pie and tagged apricot, basil, blueberry, crumble, pie. Bookmark the permalink.